I needed a pair of shrouds for my Celestial Navigator rocket, so I looked online for a shroud calculator. The choices I found didn't thrill me (as I don't have a ruler marked out in inches to three or so decimal places) so I wrote my own. Mine accepts not only the measurements of the tubes in question, but also offers pulldowns to choose from standard Estes and Centuri/Semroc sized tubes. 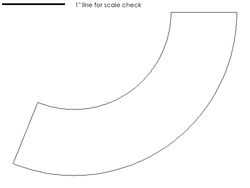 Results are presented in decimal inches (to three places), fractional inches (accurate to 32nds of an inch) and millimeters (rounded up). New! This program now generates printable template graphics! If you'd like to try it, click here. 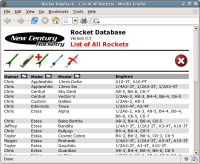 I've created a database program for tracking my rockets and my engine inventory. If you'd like to try it, click here for details. I've created an online centering ring generator tool. 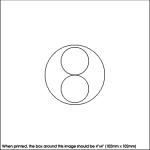 It creates 150 dpi PNG images, which can be downloaded and printed. Click here to try it out.